I’m addicted to this crazy swamp water. I really hated kombucha at first, but this fermented brew of tea and sugar feasted upon by our blobby friend THE SCOBY (Symbiotic Culture of Bacteria and Yeast) has become a constant in my fridge. The caffeine is annihilated, the sugar converts to bubbles and a tinge of alcohol (so little that I regularly share this with my kids). What’s left is a cool, flavorful, fun, stomach-settling carbonated drink that’s low in calories, high in flavor, very refreshing and, some say, is actually good for you. The kombucha recipe is here. Like any technique-driven food with few ingredients (think pasta or vinaigrette), it’s all about quality, process, and equipment. 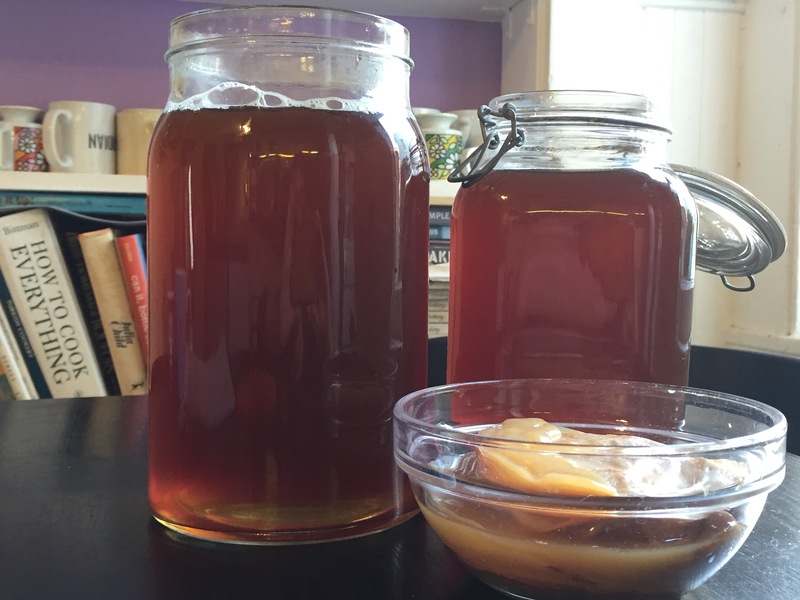 This kombucha recipe has three ingredients only: Tea, sugar, and SCOBY. The first two ingredients you likely already own. You can use any tea, but i really prefer the flavor of black tea. And you can use any black tea you like, but for the best flavor, i highly recommend something decent like PG Tips over straight-up Lipton. The sugar is regular granulated white. The third ingredient, the SCOBY, is the muscle of the whole operation; it’s critical for making kombucha. Find one from your friends or neighbors already brewing, through an online community, or just buy two (or one, and then split it into two). If you’re patient, you can also make your own. The important thing is that you treat it like the living organism that it is. The buy-in on equipment is minimal. While it’s easy to find one-gallon glass jars on the cheap, i strongly encourage you to opt for two half-gallon canning jars made from glass designed for the heat shock of boiling water. I speak from personal experience: having a massive glass jar full of scalding liquid crack or shatter on your countertop is NOT FUN. Half-gallon canning jars, the largest size available, are the way to go. Divide the tea bags between two clean, half-gallon boiling water-proof canning jars. Fill each jar halfway with boiling water. Cover the jars loosely to help keep the water hot, and let the tea steep until it’s very strong; 10-15 minutes. Remove the tea bags and pour ½ cup of the sugar into each jar. Stir the sugar to dissolve it completely. Top off the jars with cool tap water, stir, leave them uncovered, and let them come to room temperature for at least two to three hours. Make certain that your sugared tea is just barely warm, else you risk killing your SCOBY. 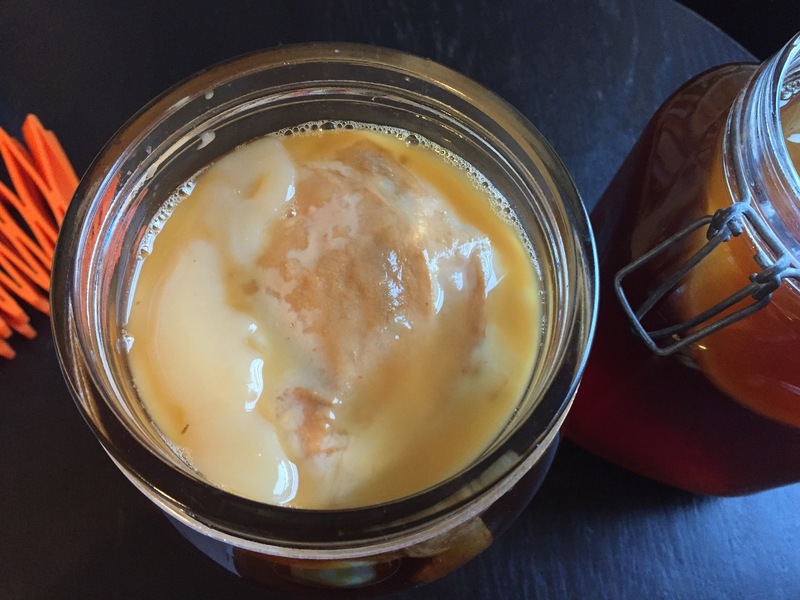 Once the liquid has cooled sufficiently, gently float the SCOBY on top of the jar. It’s OK if it sinks to the bottom at first. It will float after five days or so. Cover the jars with either a single layer of cloth or paper towel and secure it with string or a rubber band; the idea is the let air in but to keep out insects and debris. Eventually the SCOBY will float to the top and take on a thick white layer. Rest the jars away from heat and direct sunlight for a minimum of one week - however, i like my kombucha fermented for at least three weeks. The length of time here is a matter of personal preference. The longer it sits, the dryer and more fermented the drink becomes. You can always gently dip a straw under the SCOBY to taste the brew and see if you like its flavor. Your kombucha is now ready to drink - as-is or with a shot of juice. Or, if you prefer, you can add flavors and do a second round of fermentation for more carbonation in the bottle. For an extra added UMPH to your drink, i recommend bottling and adding flavors. You can bottle your kombucha in any vessel you like, but my favorite are bottles with a fairly wide top for easy cleaning. You can just use canning jars, but they are often too clumsy for pouring. I also recommend a very fine mesh sieve (like something you’d use to strain tea leaves) placed inside a funnel for less mess and a clearer brew. 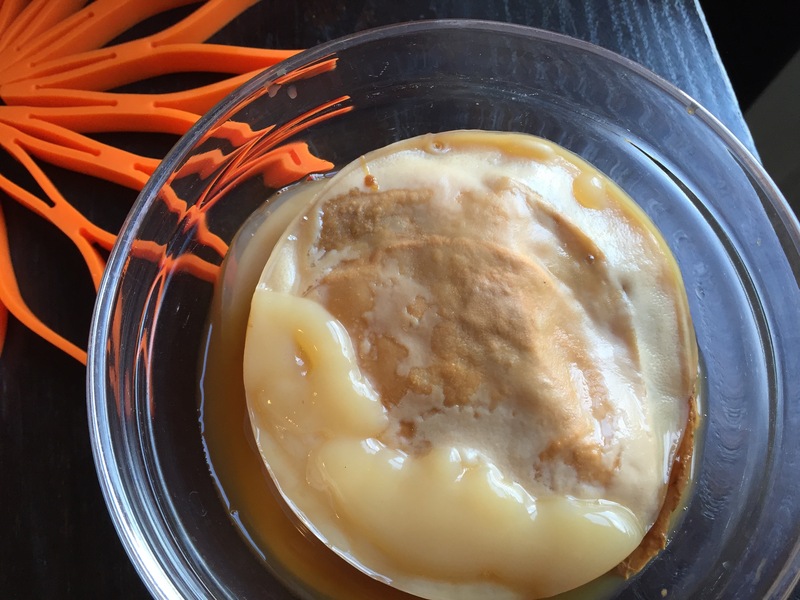 Your SCOBY may not float at first. fresh cut up fruit like halved strawberries, cubes of apple, or slices of ginger. Avoid really acidic foods like lemon or lime as they may stop the fermentation process. Keep the flavors light; I prefer not to use more than a tablespoon or two per a 750 ml. bottle. Pro-tip: add whatever fruit or sweetener you’re using when the bottle is halfway full to help it mix evenly into the bottle. Labeling the bottles is a good idea if you’re experimenting with different flavors. Leave about a half-inch of headspace at the top of each bottle, and cap it tightly. Let it sit at room temperature another two days before refrigerating. Keep in mind that this is a living food and the fermentation fun never stops. It will, however, slow down in cooler temperatures, so be sure to refrigerate it for long-term storage. Serve cold. Your kombucha will be at its best anytime in the next six to eight weeks. Provided there are no signs of mold you can drink your kombucha at any point, but take caution that the carbonation will continue to build over time. Open old bottles over the sink just in case they bubble over. I really enjoyed learning how to make Kombucha from your article. I was curious though, what do you do with the SCOBY after you bottle the kombucha? Great question! Make a strong and sweet tea – a teabag steeped til strong in about 1.5 cups of water with 3-4 tablespoons sugar – and let it cool. store your scoby in this tea in the refrigerator covered. it can be kept between batches for several months. happy brewing! Oh no! I’ll bet that was a messy lesson to learn! :> Just like soda, beer, or anything else carbonated – shaking is not a good idea. Where do you find SCOBY. I want to try this. 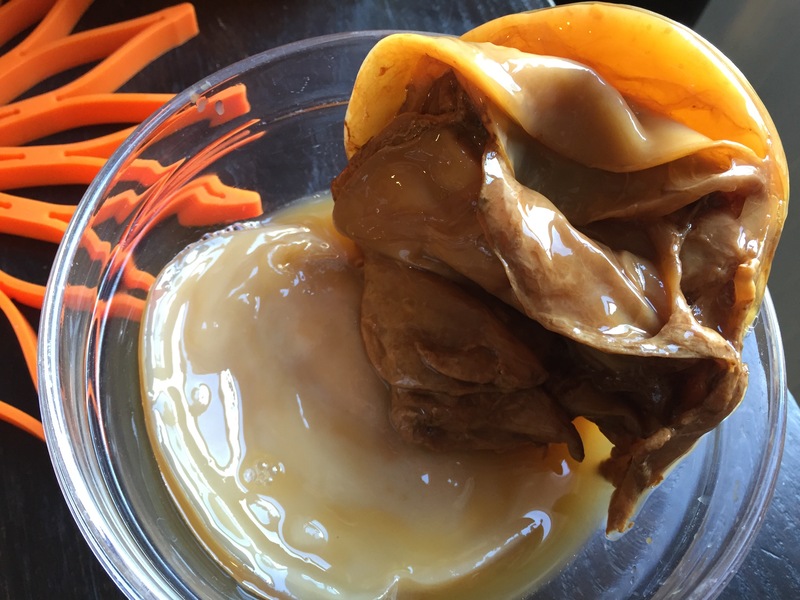 You may be able to find a SCOBY from another kombucha maker. It’s also possible to grow one from a bottle of unfiltered kombucha if you leave it sitting on the countertop and add some strong tea and sugar. If you don’t want to take the time, you can just buy one from Kombucha Kamp. Good luck! Thanks for the very good information. I am going to try this recipe. 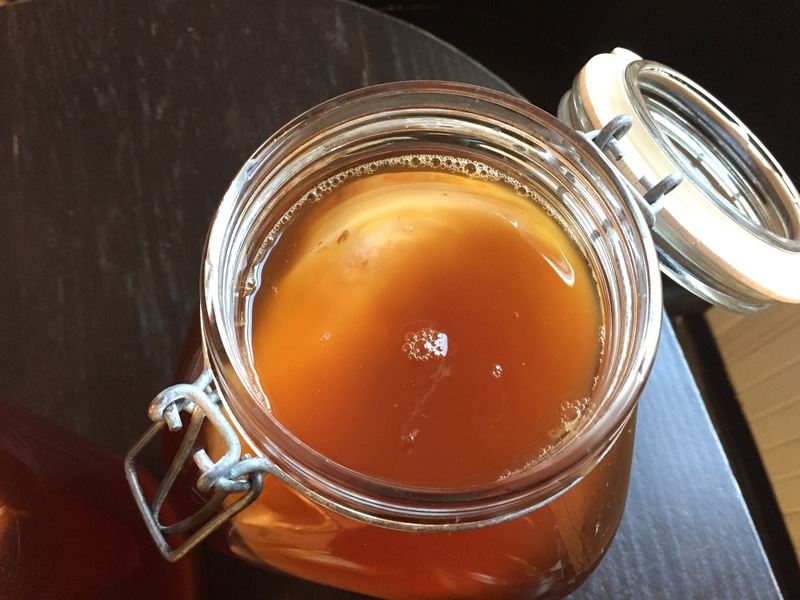 Fantastic in-depth information and the recipe for kombucha! 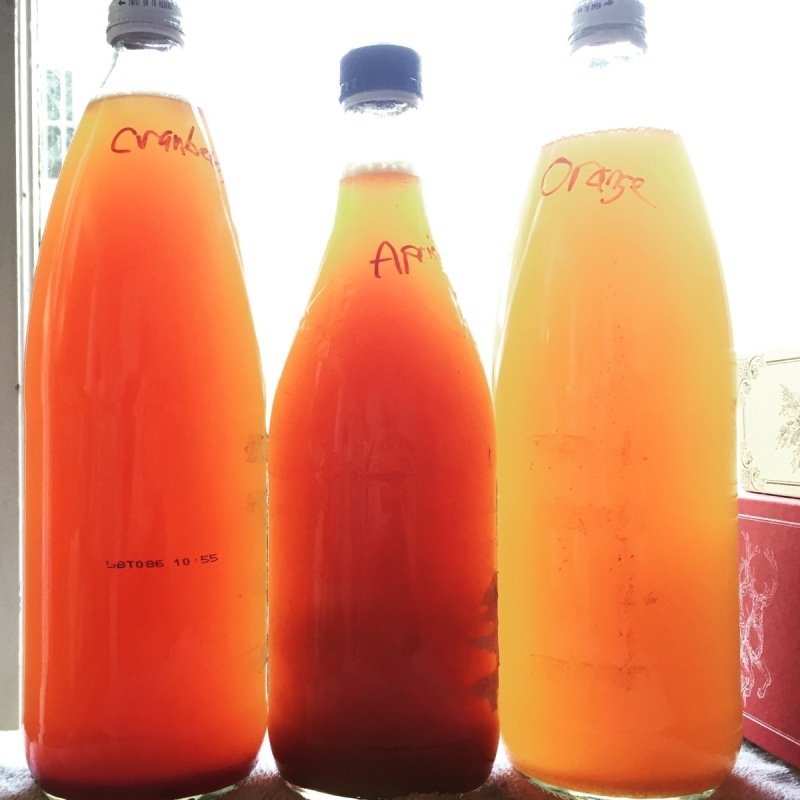 Thank you for sharing, I love kombucha and can’t wait to try making my own. So glad you like it! Best of luck in making your own.